Badgerland Lawn and Landscaping was established in 1997 by a young entrepreneur with a pickup truck and a wheelbarrow. After working for a number of local Waukesha landscaping companies by day and attending evening classes in the landscape horticulture program at MATC, a vision of a landscaping company was in the works. Badgerland started being the idea of offering the highest quality and service for an affordable price, a long warranty and a strong guarantee, and attention to details and professionalism- The Badgerland Lawn and Landscaping difference. At Badgerland, we are all about building long term business relationships and going above and beyond the industry standards bringing you complete satisfaction. Badgerland Lawn and Landscaping contractors are an extremely important part of our success. Our Waukesha landscapers are career oriented individuals with exceptional knowledge and experience in the landscaping industry. Our employees attend seminars in the off season to continue their education and keep up to date with the latest landscaping products and installation techniques. Badgerland landscapers are taught the Badgerland difference of quality, details, and customer satisfaction. At Badgerland Lawn and Landscaping, our job is not done until you are completely satisfied. Badgerland Lawn and Landscaping stays current with today’s trends and by maintaining our landscaping equipment we are able to execute the latest landscape designs. We own state-of-the-art landscaping equipment which allows us to complete our tasks as efficiently as possible, which in turn saves you money. 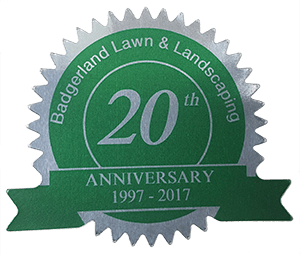 Badgerland Lawn and Landscaping has been providing the Milwaukee area with quality landscaping services, professional advice, and landscaping resources for more than 19 years. Badgerland Lawn and Landscaping Waukesha is a proud member of the Wisconsin Landscape Contractors Association (WLCA) providing professional landscaping design, services, and resources to both customers and other landscaping professionals. From being a Wisconsin BBB Accredited Business to being On Angie's List since October 2003, Badgerland Lawn and Landscaping is the best choice for quality landscaping and lawn maintenance services throughout the Milwaukee area. Badgerland Lawn and Landscaping is also proud to be part of the Snow & Ice Management Association (SIMA), nonprofit trade association, helping those who manage snow and ice master essential skills and practices needed to ensure professionalism and keep communities safe. © Copyright 2019 Badgerland Lawn and Landscape, Inc.